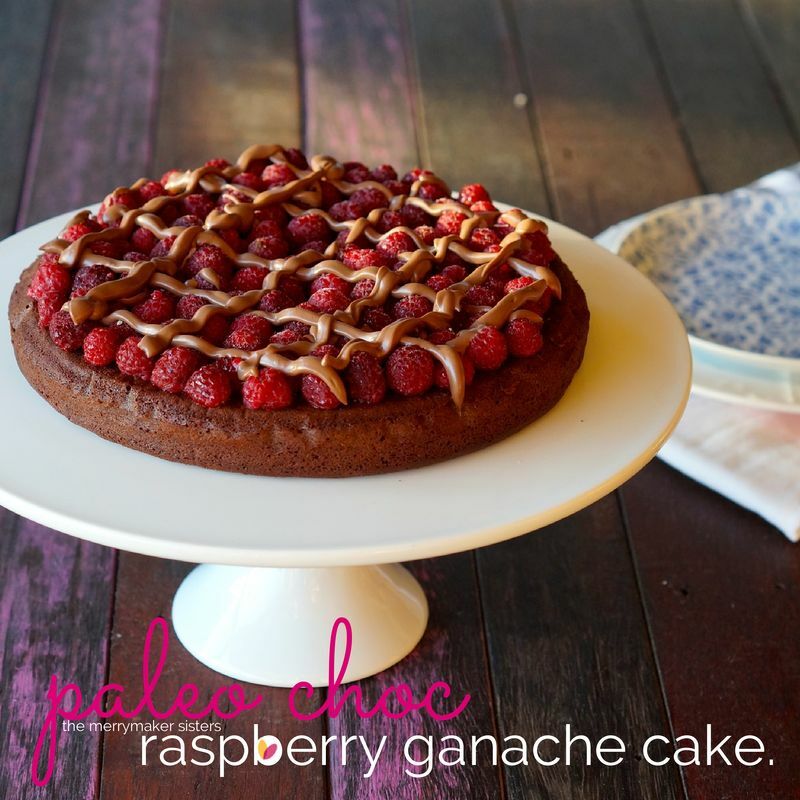 Paleo Chocolate Raspberry Ganache Cake | Freaking YUM! Paleo Chocolate Raspberry Ganache Cake Recipe. Anyone recognise this cake?! It’s a merrymaker paleo-fication of a Women’s Weekly classic! That’s right! This is our Paleo Chocolate Raspberry Ganache Cake! Pre-paleo days this was our family’s number one choice for birthdays, mothers day, fathers day, Christmas… really just any celebration that required cake! The original recipe was full of sugar and nasty stuff but with a little help from our friends at Loving Earth we’ve been able to 100% paleo-fy this baby… and it does not disappoint! We’re actually SO excited to share this choccy cake with you because, in fact, it might be better than the original! We always say that about our paleo-ficaitons but we’re serious… this cake is good. When you take a spoonful it’s like going to paleo chocolate heaven (that’s a real place). Decadent, moist, chocolate, yummy goodness. Plus, chocolate + raspberries = best combo ever! What are you waiting for? Go and make this cake STAT! If you want to get a little fancier, you could substitute the Loving Earth choccy for your own home made paleo chocolate which we have a recipe for already (how convenient!). 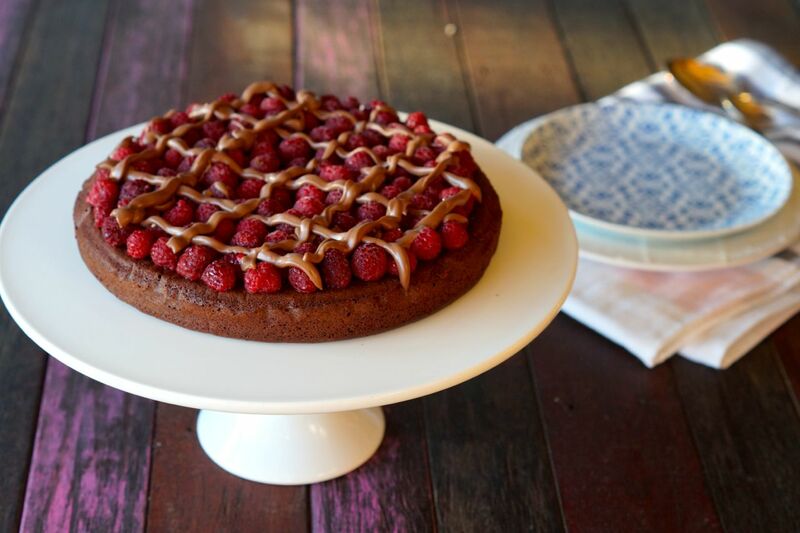 Mmm paleo chocolate raspberry ganache cake… a total Oh. My. Food. moment! Preheat your oven to 170 degrees celsius and line a 22cm cake tin with baking paper. Mix the raw cacao powder and water in a large mixing bowl until smooth. In a double boiler, melt the chocolate and butter together. Remove from heat. Add this to the large mixing bowl along with the coconut sugar, almond meal and egg yolks. In a mix master, beat the egg whites until soft peaks form. Fold this in to the chocolate mix carefully until just mixed through. Transfer the batter in to the prepared tin and place in to the oven for 1 hour. Allow the cake to cool in the tin for 15 minutes before turning out. Arrange the raspberries on top of the cake and drizzle with chocolate ganache! Combine the raw chocolate and coconut cream in a small saucepan on low heat, stirring until smooth. Instead of using bought raw chocolate, you can make your own paleo chocolate! We've got a recipe already.